Home Fire Alarm What Makes Our Wireless Fire Alarm Call Points Different? Do you want to have the most effective and most convenient system that will help save life and protect your assets against incidents of fire? If yes, worry no more as our company is here to help you out with such concerns. Our company is known for its expertise and professionalism and to be one of best in the field of wireless fire alarm call points. At Bison Security Ltd, we are aware of the fact that there are lots of companies that offer the same product just like us. That is why, we make it a point to have our wireless fire alarm system and call points different from the others with regards to being fit for purpose, quality of service and products used. We make use not only of the most advanced radio technologies to help communicate with a wide range of wireless sensors, keypads as well as sounders too, this is linked to an alarm system that sends a signal to the Control Monitoring Centre through the use of GSM (Global System for Mobile communications) * or mobile phone networks where the centre completely and effectively monitors the site 24 hours a day. *Standard developed by the European Telecommunications Standards Institute (ETSI) to describe the protocols for second-generation digital cellular networks used by mobile devices such as tablets. 24 hour alarm system operating 7 days a week. Integrated call points and sirens. Initiate silent test of the system. With all these features that we offer at Bison Security Ltd, we are confident to say that we can be the best company to give our clients and their sites peace of mind in terms of safety, security and protection. We believe that we are always ready and willing to listen to our clients about the safety concerns they may have in the construction industry and can act accordingly. We make sure that the products that we will give them will operate to the best that they can and well-maintained and fit for purpose when it comes to alerting the users of any fire that could occur. Why Choose Our Wireless Fire Alarm System and Call Points? Life preservation and protecting assets are essential for any company’s moral code, existence and public image! Our products can help through the installation of our wireless fire alarm systems and call points. Though, we are aware of the fact that there maybe some confusion aboutthe products we offer, what they do and which system suits best. We are confident that if the client speak to us, tries our fire warning systems, then they will be very happy with the results and want to keep using our services time after time and will recommend us to others. 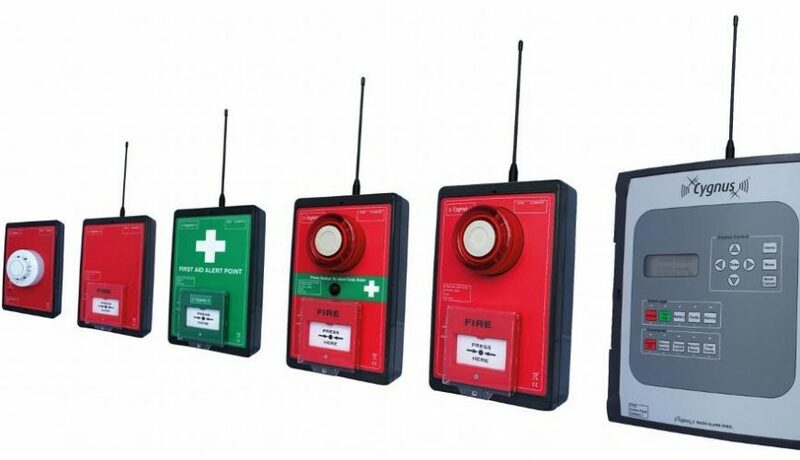 As far as our wireless fire alarm systems and call points are concerned, we make sure that they are all made from high quality materials and use the latest technology and in doing so will also prevent serious fire incidents from happening and if they do then the response from the emergency services will be so much quicker and therefore more effective. Apart from that, we will also offer these alarm services at some of the most reasonable rates in the country, meaning that they no longer need to spend a huge amount of money for their wireless fire alarm system anymore without compromising on quality. So, what are you waiting for? Don’t miss out the chance to get in touch with us at Bison Security Ltd. We promise to give you only the best wireless fire alarm system and call points that you deserve and what your premises need in terms of site fire security!